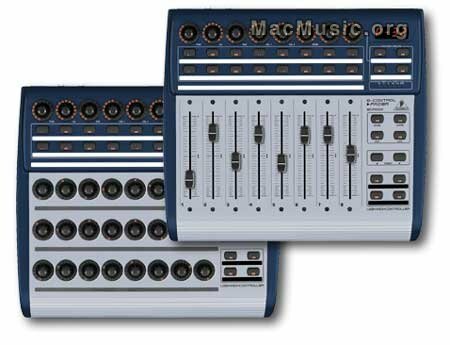 - 2488 : a 24 bit, 24 tracks, 36 channel Portastudio with CD-Writer and USB2.0 interface. - 2 news DJ-oriented double CD-Players with a new option, an add-on for your turntable to use it as a controller for the two new CD player. Tascam News (PDF) Post a comment ? Behringer has announced the B-CONTROL FADER BCF2000, a fader-based USB control surface for MIDI hardware or software, and the ROTARY BCR2000, with rotary controls. The BFC-2000 has eight 100 mm programmable faders, 8 programmable encoders, MIDI 1 In/2 Out/1 Thru (read carefully the manual about these, it doesn't seem to be a full fledged MIDI interface, and the Thru eats a MIDI Out). 4 virtual groups and 20 buttons also assignable to MIDI, syssex, MMC, transport functions are possible. The similar ROTARY BCR2000 features 24 rotary controlers, plus the same buttons and 8 top rotary encoders. Unfortunately the editing software is PC only but profiles will be available shortly, both units are supported under OSX and should work with all MIDI software. Announced compatibility is for Cubase and Logic, check the Behringer site for more. 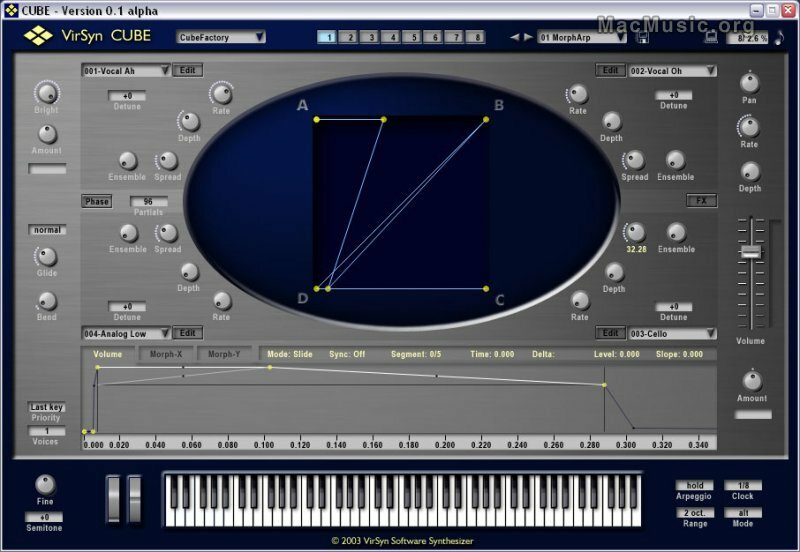 CUBE by VirSyn is a software instrument that gives you the power and flexibility of additive synthesis together with easy editing and morphing capabilities. The 1.5 release adds additive resynthesis capabilities with new features: decomposition of samples into 512 partials and a special "Formant" Analyzer that enables automatic extraction of the sound characteristic. VirSyn Cube 1.5 Post a comment ? Kurzweil has announced the VA1, a new instrument (61 keys, 16 polyphonic notes and 4 multi voices). The kind of synthesis is "virtual analog". Each note allows 7 audio sources with no reduction of the polyphony. The VA1 has a large FX module (from the famous KDFX and DSP8), and a 48-band Vocoder (with a stereo preamp and phantom power supply to process external tone). 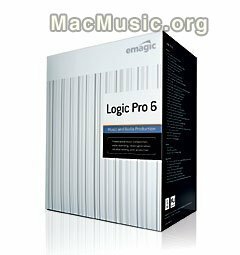 - The Logic Pro 6 includes Logic Platinum 6 music production software plus the complete Apple/Emagic DSP and audio instrument product line ( ES1, ES2 and EVOC20 software synthesizer, the software sampler EXS24 mk II, the EVB3, EVD6 and EVP8 Vintage Collection and Space Designer). Logic Pro costs 999 euros. - The Logic Express includes a 48 tracks Logic software, plus the EXSP24 sample player, the EVP73 Vintage Piano and the ES1 Synthesizer. Logic Express costs 299 euros. Emagic Post a comment ?